Home Page > Saffron > What is Saffron? 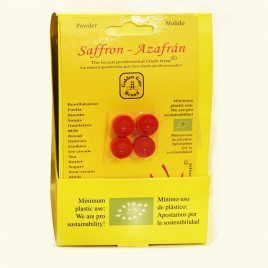 I have been selling saffron for over 35 years and in that time have never ceased to be amazed by its uniqueness in the spice world. Saffron has an aroma and flavor which cannot be duplicated, and a chemical make-up which, when understood, helps the chef or home cook to know how to best release that flavor and aroma in cooking and baking. Saffron is sold in two forms, powder and threads, and each behave very differently in the kitchen.In order to understand commercial saffron, it is important to understand the make-up of the saffron plant. More importantly, it is the easiest way for you, as a consumer, to be sure you are buying good saffron. Commercial saffron comes from the bright red stigmas of the saffron crocus (Crocus sativus) which flowers in the Fall in many different countries, including Greece, India, Iran, Afghanistan and Spain. 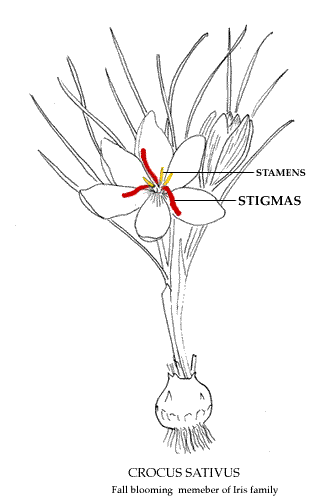 The Crocus sativus stigmas are the female part of the flower. In a good year, each saffron crocus plant might produce several flowers. Each flower contains three stigmas, which are the only part of the saffron crocus that when dried (cured) properly, become commercial saffron. Each red stigma is like a little capsule that encloses the complex chemicals that make up saffron’s aroma, flavor, and yellow dye. In order to release these chemicals, you must steep the threads. Powdered saffron is more efficient because it does not need to be steeped (see more on this later in this text). 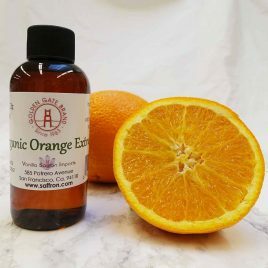 An easy way to relate to the powerful effect of the chemicals contained in each saffron stigma is to experience the difference between working with saffron threads and saffron powder in your kitchen. Unfortunately, saffron powder has been characterized, unjustly, as inferior to saffron threads. The consumer has never received honest information about this form of the spice. 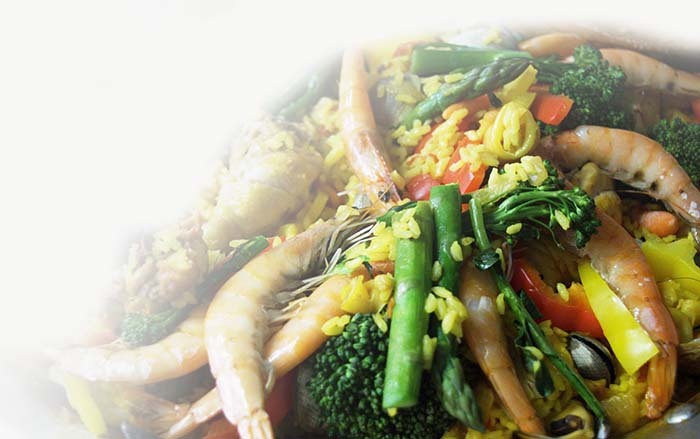 In fact, saffron powder, with a high coloring strength, offers many advantages over the threads. When saffron threads are ground into powder, the chemicals corresponding to aroma, flavor and color are immediately released. The powder is then stored carefully, away from moisture and light, just as the threads need to be in order to maintain their potency. When the saffron powder reaches the chef, it is ready to be added directly to any recipe. When the chef adds the saffron powder to a recipe, immediately the deep yellow dye, delicate aroma and unique flavor are released. 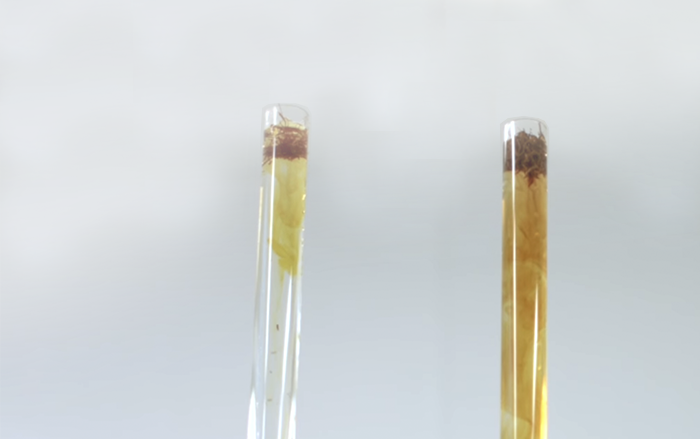 In order to release the potent chemicals in saffron threads, they must be inmersed , in an alcoholic, acidic or hot liquid for longer than just a few minutes. This allows aroma, flavor and color to be generously extracted. Notice I am not saying “fully” extracted. Saffron threads can release aroma, flavor and color for 24 hours or more, depending on their quality! This is an inconvenient time frame for busy professional chefs and most home cooks, so I tell my clients to shoot for an extraction time of no less than 20 minutes and more if they can manage (See additional information under Working with Saffron). The professionals who define Category I saffron as needing a minimum of 190, are called the International Organization for Standardization (ISO). They have set minimum, not maximum standards for saffron. 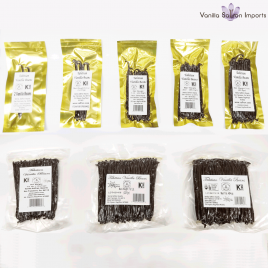 I sell the best quality saffron available anywhere in the world, backed by scientific evidence. When you buy my saffron, I can show you a photospectromety report which verifies its high coloring strength. This is the only method used internationally to measure saffron’s worth. The higher its coloring strength, the higher its value. Saffron’s coloring strength determines its flavor and aroma. 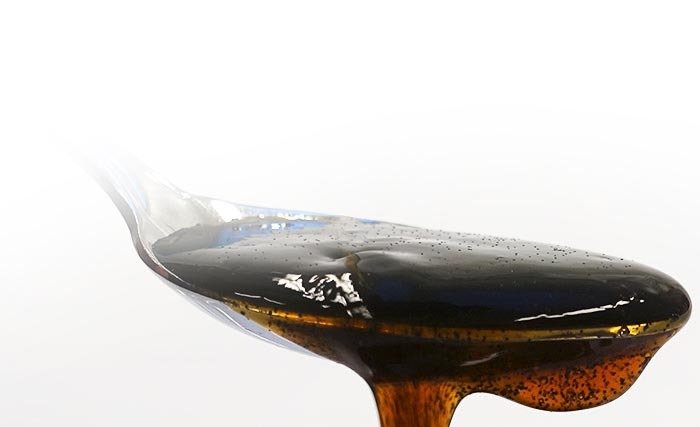 You will read and hear all kinds of other things about measuring saffron like you should look for a particular color and size in saffron threads and that you should probably avoid saffron powder altogether. This is misinformation. If saffron has the right coloring strength, it will have the right color and general appearance, whether it is in thread or powder form. So what coloring strength numbers should you be looking for? I’ll just give you the possible ranges based on the laboratory reports provided to me on many different batches of saffron I have sent for analysis. 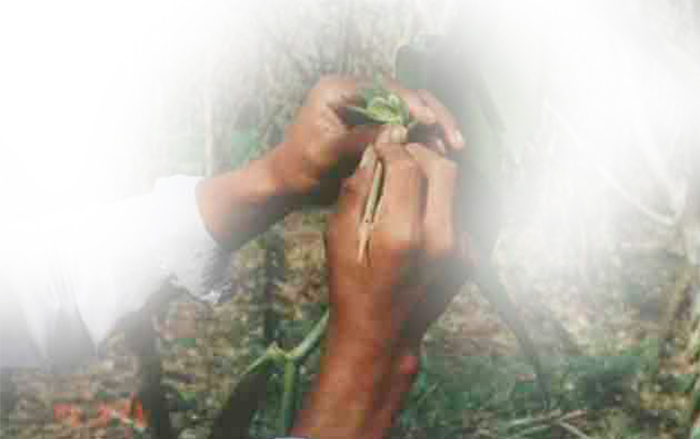 The international standard minimum for Category I saffron is 190. My Golden Gate Brand saffron has a coloring strength of between 230 and 280. The worst laboratory report I have seen to date on saffron sold in the U.S. is 110. Can you imagine the difference in the aroma, color and taste of your dish if you use a saffron with a coloring strength of 260 compared with one which only measures 110, 140 or even the minimum standard, 190? It is the equivalent of comparing a cheap, sparkling wine with a fine champagne. As you can see, it is important to understand how coloring strength applies to commercial saffron. Buying inferior saffron means you are actually doubling your per serving cost. The head chef of a major culinary academy was complaining to me about how wasteful his students were with saffron. He explained that he bought cheap saffron because of this. I told him his students were probably not being wasteful but instead kept adding more saffron to their recipes because it was the only way they could get the color they were looking for. Really there is no such thing as “cheap” saffron. There is only quality saffron and inferior saffron. If you use quality saffron, it is easy to be consistent about the amount to use in every recipe. As a purveyor my primary job is to find the best product and to make a profit on volume. If you feel you are satisfied with the quality of your saffron, YOU BETTER CALL ME! After you try my Golden Gate Brand saffron, you will not want to use any other brand. If you are not satisfied, we offer a MONEY BACK GUARANTEE. Inferior saffron not only ends up costing more, it produces an inferior end product in cooking and baking. 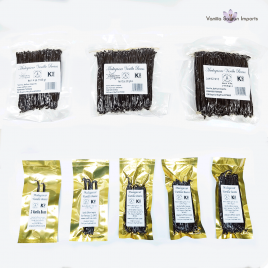 Whether you are a professional chef, a supermarket spice buyer, a beer or pasta manufacturer, a pharmacist, a discriminating home chef, a caterer, or user of natural dyes, I can supply your needs. Call me at (415) 648-8990 or fax (415)648-2240.